Summer Solstice will be presented today for your enjoyment at 7:28 AM Eastern time, 6:28 AM Central. 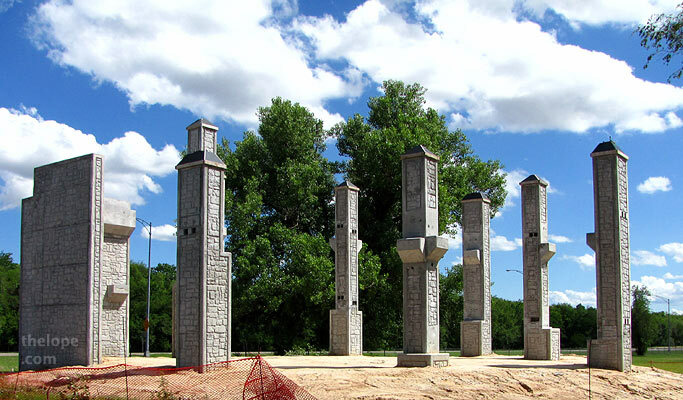 These support structures are part of the under-construction new Kansas highway 61 at 30th Street in Hutchinson, Kansas. They're as close as I could get to megaliths, of late. You know, I've been thinking much more about historical documentation lately. I could shoot another angle without the fencing, but the fact is that in 2010 we use ugly orange plastic construction fencing, so there you are.